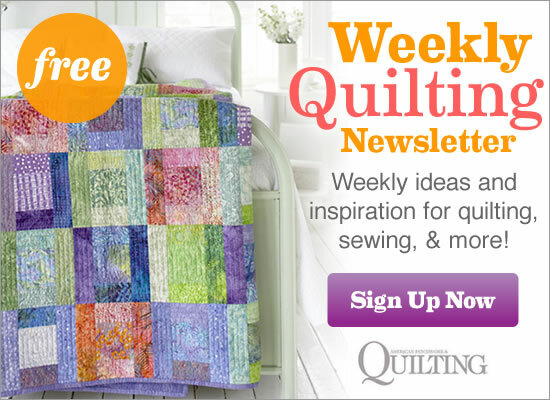 See the featured quilts and web-exclusive color options and projects from the American Patchwork & Quilting December 2015 issue. The December 2015 issue of American Patchwork & Quilting is on sale from October 6--December 1. Designer Pam Buda’s prairie-style fabrics and quilt patterns have their roots in ordinary pioneer women. Combine silver and gold to get a luxe look for the season. Double Sawtooth Star blocks in metallic prints add a splash of shimmer to your decor. Combine African-theme prints and bright batiks in a quilted throw. Solid black sashing creates crisp lines and makes the savanna scenes in the center of the quilt come to life. Sew a table runner fit for the season using foundation piecing and machine appliqué. Fabrics: Gathering Basket collection by Kim Diehl and Cozy Yarn Dye Flannels, both from Henry Glass & Co.
Quilt tester Laura Boehnke opted for soft purples and greens instead of traditional reds and greens for her fusible-appliqué version of Christmas Cottage. She combined flannels and florals for a holiday table topper that easily transitions to spring. Fussy-cutting plaids makes easy work of the house windowpanes. Felted wool cones embellished with hand embroidery and fringe become the perfect Christmas tree pincushions. They also double as adorable holiday decor—for your sewing room or any room in the house. Let cute holiday prints do the work of decorating your home. Use them to band bath towels, as designer Kathleen Malarky did here. Make custom travel accessories so it’s easy to identify your bag on the baggage carousel. Tammy Silvers used white and black prints and contrasting green topstitching to craft her luggage strap, luggage tag, and laundry bag. Woven Plaids are from the Brushstrokes collection by Pepper Cory for Studio E Fabrics. Combine quilting cottons and felted wool with easy appliqué. Choose your favorite design from Becky Goldsmith of Piece O’ Cake Designs or make all three eyeglass cases (or rotary-cutter holders!) and give them as gifts. If you fall in love with a fabric collection, snag this idea from designer Liz Taylor to use lots of it. Top your favorite print with skinny pleats in the coordinating prints. By adding faux fur trim and folding the tip down, designer Lisa DeBee Schiller made easy Santa hats using a basic pattern. In this nod to a traditional Thousand Pyramids quilt, diamonds pieced in the colors of gemstones shine on a muted background. For her version of The Perfect Setting, quilt tester Laura Boehnke “painted” a masterpiece using fabrics inspired by famous Vincent Van Gogh paintings. Swirls, textures, and scenes from Van Gogh paintings enliven the jewel-tone prints, helping to create a wall hanging that can enjoyed up close and from afar. Laura framed her work of art with two borders. Scrappy triangle-squares sparkle on an indigo-blue print background. Use precut 10" squares for almost no fabric waste. Bring a fresh look to your table with a quilt made from cool blue, green, and gray prints. Fun stripes for borders add movement to the table runner. No matter where you sit in relation to this table topper, a happy snowman will be smiling at you. Sew a bright and whimsical table topper using an assortment of floral prints and bright borders. A carefully arranged pink zigzag print highlights the Nine-Patch blocks. When it’s cold outside, stay inside and sew a throw made of Snail’s Trail blocks, which bring to mind swirling snow. Choose florals in green, blue, and pink for a color palette reminiscent of an English garden. Get a scrappy look by limiting your color palette yet using a variety of prints. Designer Jean Wells wraps up a year-long exploration of color and improvisational piecing with Early Spring, a one-of-a-kind wall hanging. Combine bold florals and rich solids in Sawtooth Star blocks to stitch a happy quilt. Pair gray, an updated neutral, with sweet pastels in a star-studded wall hanging. Use solids and near solids to balance some of the exuberant prints. Framelike strips and a background of checkerboard units make a wintry panel print pop. Ocean-theme prints paired with beachy blues and sandy tans are perfect for a kid’s quilt. A stripe border print ties all the colors together for a playful finish. Winding Trails goes from winter to spring in Joanna Figueroa’s downsize version. Joanna oriented all the 4-1⁄4"-square blocks in the same direction instead of rotating every other one as in the original quilt.